You can run into problems in your work injury case if you wait too long to notify your employer about your injury, or if you wait too long to file a claim with the State Board of Workers’ Compensation. Georgia’s workers’ compensation law says that you must give notice to your employer about a work injury within 30 days following the workplace accident. If you fail to provide notice, your employer and their insurance company can deny your claim. If your injury is the result of long term repetitive activity, your notice should be given within 30 days from the date you first noticed a problem. What Does it Mean to Give Proper Notice to Your Employer? Proper notice means reporting your accident and injury to a supervisor, owner or manager at your job. Whenever possible, give your notice in writing, or, if you give notice verbally, ask for a copy of the incident report or a written acknowledgement that you have reported a work injury. Mentioned to a co-worker that you think you hurt yourself on the job is not good notice. Similarly, if you verbally notify your supervisor that you think you may have hurt yourself may not be sufficient either. Your report of injury should be detailed and descriptive. It can be uncomfortable reporting a work injury to a supervisor or company owner. Business owners do not like workers’ compensation claims – they result in higher insurance costs and lost productivity at work. However, you should not assume that you will create goodwill by holding off on reporting a work injury. 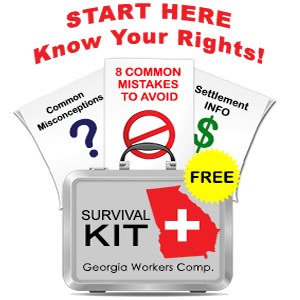 Georgia is an “at will” employment State and you could easily find yourself without a job and without medical care or lost wage benefits if you don’t report your injury. Our experience has been that you are much better off reporting your work injury as soon as possible. Waiting to file your report usually will damage your claim. If, for example, you fall off a ladder and hurt your back on a Thursday, but wait until the following Wednesday to report your injury, your employer and their insurance company may try to argue that you really hurt yourself at home over the weekend, or while you were off the clock. They may also argue that your injury couldn’t be that serious since you waited to report it. Reporting your injury immediately improves the chances that any witnesses will remember what happened and that you can take pictures of the site where you were hurt before it is cleaned up. Georgia law also says that you have up to one year to file a claim with the State Board. Here, too, there is no good reason to wait. In theory, your employer should file a first report of injury with the State Board after receiving your notice of injury. However, you would best be served by protecting yourself filing (or having your attorney file) a notice with the State Board. Here, too, we have seen too many instances where an injured employee thought that his/her employer was “doing the right thing” only to discover that the employer did nothing in the hope that the injured employee would give up and go away. If you’d like to know more about how to report your injury and how to protect your claim by giving notice to the State Board, we’re happy to help. Call our office at 770-351-0801.